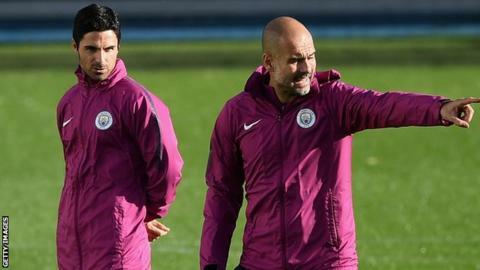 Manchester City assistant coach Mikel Arteta is one of a number of options being considered by Arsenal as their new manager. Spaniard Arteta, who made 150 appearances for the Gunners and captained the side, took up a coaching role at City in 2016. However, the club is not close to making an appointment yet. Also among those contacted by Arsenal during the process is another of their former captains, Patrick Vieira. The club remains confident of naming a successor before the World Cup begins on 14 June. Once a decision has been made by chief executive Ivan Gazidis, head of football relations Raul Sanllehi and head of recruitment Sven Mislintat, the trio will present their recommendation to Arsenal's board of directors for approval. Wenger will take charge of Arsenal for the final time on Sunday against Huddersfield, after almost 22 years in the role. Ex-Barcelona coach Luis Enrique has been linked with the job, along with Juventus boss Massimiliano Allegri. One ex-Arsenal player definitely returning to the club this summer is Freddie Ljungberg. A deal has been done for the Swede to take charge of one of the youth teams on a permanent basis. My sense from speaking to people inside and outside the club is that Arsenal are conducting a very detailed and diligent recruitment process. Those with direct and indirect knowledge have commended the way in which the Gunners hierarchy are going about their business. They seem acutely aware of how important a decision this is, but also that it is complex, could well divide opinion and brings with it no guarantee of success. Their priority is to make the right decision, rather than a quick one, though time is obviously of the essence given the World Cup starts in fewer than five weeks and the transfer window, which opens on 17 May, closes on 9 August. The favourite for the job with bookmakers and many fans and pundits is Allegri, but Arteta is firmly in the mix, and although these two appear to be the frontrunners, I get the feeling other names are in the frame.